Problems that affect the Achilles tendon are common among active, middle-aged people. In severe cases, the force of a violent strain may rupture the tendon. The classic example is a middle-aged tennis player or weekend warrior who places too much stress on the tendon and experiences a tearing of the tendon. 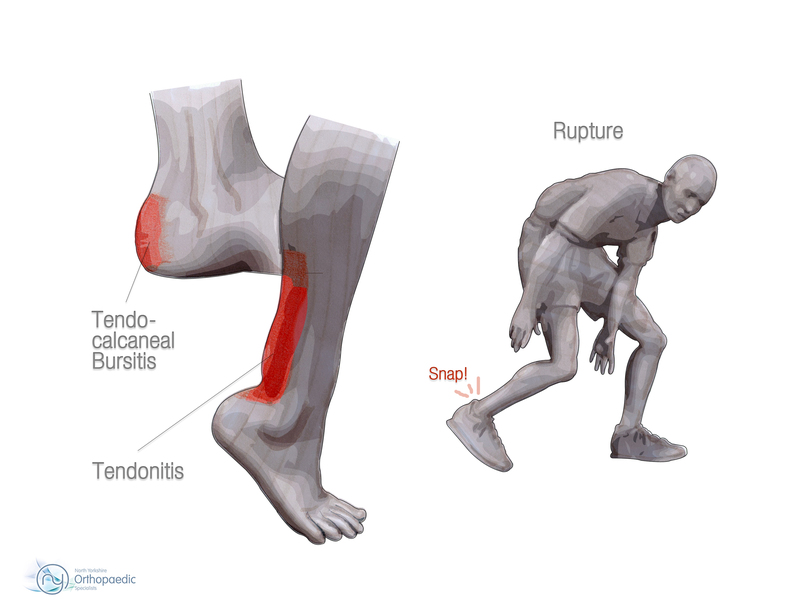 In some instances, the rupture may be preceded by a period of tendonitis, which renders the tendon weaker than normal. As we age, our tendons can degenerate. Degeneration means that wear and tear occurs in the tendon over time and leads to a situation where the tendon is weaker than normal. Degeneration in a tendon usually shows up as a loss of the normal arrangement of the fibers of the tendon. Tendons are made up of strands of a material called collagen. Some of the individual strands of the tendon become jumbled due to the degeneration, other fibers break, and the tendon loses strength. Diagnosis is almost always by clinical history and physical examination. The physical examination is used to determine where your leg hurts. The consultant will probably move your ankle in different positions and ask you to hold your foot against the consultant's pressure. By stretching the calf muscles and feeling where these muscles attach on the Achilles tendon, the consultant can begin to locate the problem area. The consultant may run some simple tests if a rupture is suspected. One test involves simply feeling for a gap in the tendon where the rupture has occurred. However, swelling in the area can make it hard to feel a gap. Another test is done with your leg positioned off the edge of the treatment table. The consultant squeezes your calf muscle to see if your foot bends downward. If your foot doesn't bend downward, it's highly likely that you have a ruptured Achilles tendon. When the consultant is unsure whether the Achilles tendon has been ruptured, a magnetic resonance imaging (MRI) scan may be necessary to confirm the diagnosis. This is seldom the case. The MRI machine uses magnetic waves rather than X-rays to show the soft tissues of the body. The MRI creates images that look like slices and shows the tendons and ligaments very clearly. This test does not require any needles or special dye and is painless. Your consultant may order an ultrasound test. An ultrasound uses high-frequency sound waves to create an image of the body's organs and structures. 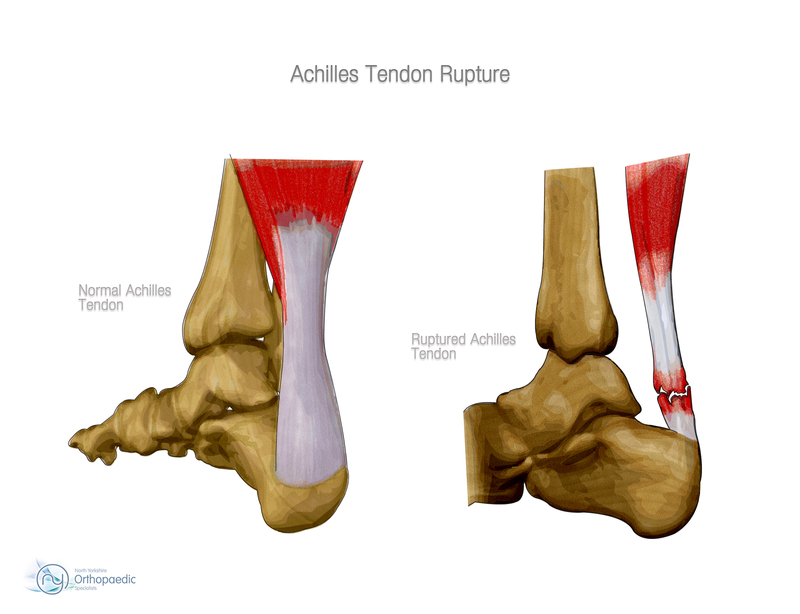 The image can show if an Achilles tendon has partially or completely torn. This test can also be repeated over time to see if a tear has gotten worse. By using the MRI and ultrasound tests, consultants can determine if surgery is needed. For example, a small tear may mean that a patient might only need physical therapy and not surgery. Non-surgical treatment for a ruptured Achilles tendon is an approach that might be considered for the aging adult who has an inactive lifestyle. Nonsurgical treatment in this case allows the patient to heal while avoiding the potential complications of surgery. The patient is casted for eight weeks. Casting the leg with the foot pointing downward brings the torn ends of the Achilles tendon together and holds them until scar tissue joins the damaged ends. A large heel lift is worn in the shoe for another six to eight weeks after the cast is taken off. 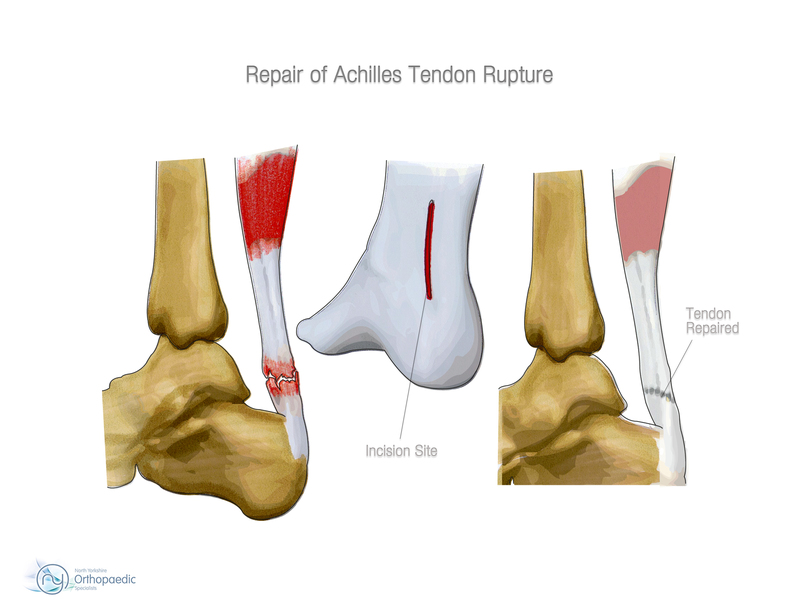 Reattaching the two ends of the tendon repairs the torn Achilles tendon. This procedure is usually done through an incision on the back of the ankle near the Achilles tendon. Numerous procedures have been developed to repair the tendon, but most involve sewing the two ends of the tendon together in some fashion. Some repair techniques have been developed to minimize the size of the incision. Traditionally, patients would be placed in a cast or brace for six to eight weeks after surgery to protect the repair and the skin incision. Crutches would be needed at first to keep from putting weight onto the foot. Conditioning exercises during this period help patients maintain good general muscle strength and aerobic fitness. Upon removing the cast, a shoe with a fairly high heel is recommended for up to eight more weeks, at which time physical therapy begins. In this early-motion approach, physical therapy starts within the first few days after surgery. Therapy may be needed for four to five months. Ice, massage, and whirlpool treatments may be used at first to control swelling and pain. Massage and ultrasound help heal and strengthen the tendon.